Posted on Sun, Mar 4, 2012 : 5:56 a.m.
See the film "Rango," part of the "Family-Friendly Film Series" at the Michigan Theater. Today and Monday, 1:30 p.m. Rango is a sheltered chameleon living as an ordinary family pet, until he accidentally winds up in a lawless outpost. Welcomed as the last hope the town has been waiting for, new Sheriff Rango is forced to play his new role to the hilt. Kids under 12 get in free. $10/ general admission. The Michigan is at 603 E. Liberty St., Ann Arbor. 734-668-8397. 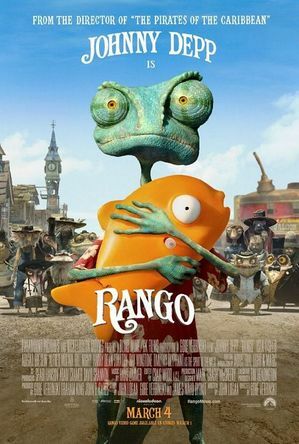 "Rango" will be shown today and Monday at 1:30 p.m. at the Michigan Theater. There will be an "Author Event and Book Signing" with Denise Swanson and Casey Daniels at Aunt Agatha's Book Shop. 1:30 p.m. Swanson launches a new mystery series with "Little Shop of Homicide." Daniels will sign her new book "Buttonholed." Refreshments will be served after the discussion of cozy mysteries by two of the most experienced authors in the genre. Free admission. Aunt Agatha's is at 213 S. 4th Ave. Ann Arbor. 734-769-1114. The Chelsea Area Players Dinner Theater will present "Weekend Comedy" at the Chelsea Community Hospital. 2 p.m. Two couples from different generations are accidentally booked for the same Catskills cabin. $35, includes dinner and show. Tickets available online at: www.brownpapertickets.com/event/225611 or in person at Chelsea Pharmacy, 1125 South Main St. Performances take place in the Chelsea Community Hospital Dining Room at 775 S. Main St., Chelsea. 734-475-1311. Help patient and family support programs at the "Annual Hearts On Ice Hockey Challenge" at the Ann Arbor Ice Cube. The "Blades" will battle the "Pills." Kids skate free. All proceeds support the U-M Heart Transplant Program. Free admission, donations gratefully accepted. The A2IC is at 2121 Oak Valley Dr., Ann Arbor. Take the kids to Hollander's to see "Kerry Tales: Cats, Fiddles, and Mother Goose." 2 p.m. Storyteller Trudy Bulkley entertains as Mother Goose with rhymes and stories. A 30-minute program for young and old alike. Free. Hollander's is at 410 N. Fourth Avenue First floor of the Kerrytown Shops, Ann Arbor. 734-741-7531. The Old Town Tavern is bringing back its "Sunday Music Series." 8 to 10 p.m. Tonight, see the Jo Serrapere Trio. For those who enjoy roots music, this should be a real treat. No cover. Old Town is at 122 W. Liberty St., Ann Arbor. 734-662-9291.